Start managing your donations online. Start from a template and make it your own. This form template is an example for a environmental non-profit. Make it your own in minutes. Every campaign and non-profit needs a form that supports its goal. Making campaigns, donation forms and landing pages should be fun instead of a chore. That's all easy with Serviceform. Serviceform is used by small and large non-profits globally. We have over 600 users globally. Join the winning team today. Serviceforms simply work great. We have seen up to 5 times improved donation conversion compared to traditional forms. Our non-profit customers love how easy it is for them to manage everything through one system. We use Stripe for recurring payments, which helps you get your donations directly to your bank account. 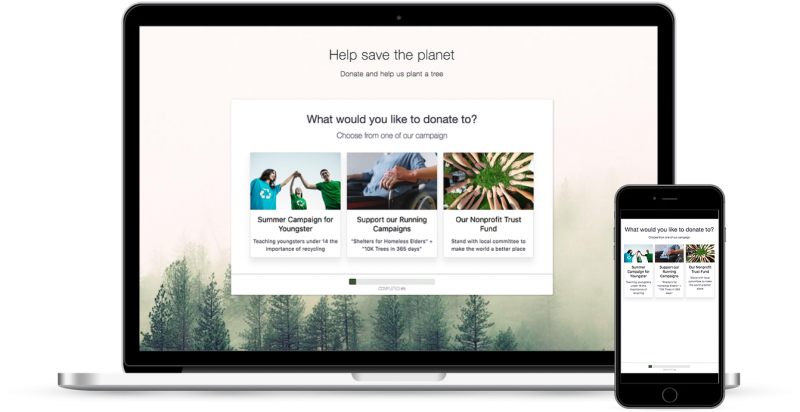 Creating fundraising campaigns is time consuming, but with Serviceform you can create and change your donation forms in seconds instead of weeks.